I always thought Arugula was a bit spicy and bitter for my taste so I had avoided it for a long time until I found out its amazing benefits. Then the health-conscious part of my brain said, “well, give it another shot because it’s not exactly like you’d be choking it down.” So I tried it again…but this time with an amazing dressing that balances it’s tartness. Besides the extra virgin olive oil in the dressing, I added an awesome healthy fat in the form of crushed macadamia nuts. Nummy! Dark leafy greens are no brainers when it comes to giving your brain valuable nutrients like nitric oxide--so important is increasing blood flow to parts of the body requiring extra nutrients. Arugula contains the highest amount of any vegetable. 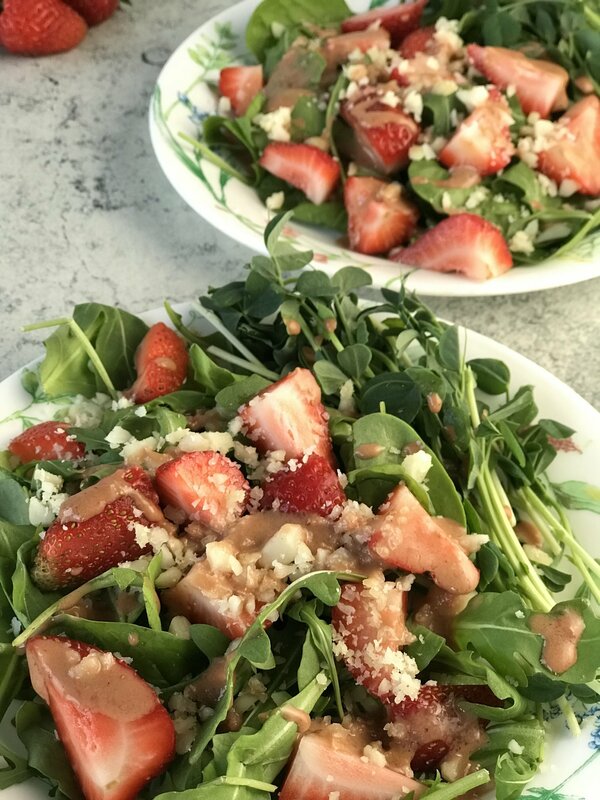 In fact, even one meal of arugula has been shown to improve cognitive performance according to a 2015 study published in the journal Physiology and Behavior. Džoljić, E. “Why Is Nitric Oxide Important for Our Brain?” Functional Neurology, 2015, doi:10.11138/fneur/2015.30.3.159. Kuriyama, Kinya, and Seitaro Ohkuma. “Role of Nitric Oxide in Central Synaptic Transmission: Effects on Neurotransmitter Release.” The Japanese Journal of Pharmacology, vol. 69, no. 1, 1995, pp. 1–8., doi:10.1254/jjp.69.1. Admin. “6 Foods to Send Nitric Oxide Levels Soaring.” The Good Inside at Touchstone Essentials, Touchstone Essentials, 25 Mar. 2018, thegoodinside.com/6-foods-to-send-nitric-oxide-levels-soaring/. Lugavere, Max. Genius Foods: Become Smarter, Happier, and More Productive, While Protecting Your Brain for Life. Harper Collins Books, 2018. pg. 134. Wightman, Emma L., et al. “Dietary Nitrate Modulates Cerebral Blood Flow Parameters and Cognitive Performance in Humans: A Double-Blind, Placebo-Controlled, Crossover Investigation.” Physiology & Behavior, vol. 149, 2015, pp. 149–158., doi:10.1016/j.physbeh.2015.05.035.